Probably when most people spy a book like Jeanne Kelley’s Salad for Dinner at the bookstore or in their library they pick it up and think Mmmm, this looks nice and healthy. Or: I could afford to shake up the Romaine routine. My first thought? A veritable treasure trove of potentially deconstructable dinners. True, I can look at almost any meal and envision how it can break down into child-friendly, nothing-touching, no-green-speck meals to please the sauce-o-thropes at the table. (Pasta works, so does a pot roast.) But salads have got to be the most conducive. And if ever there were a cure for the parents who cannot seem to find common ground between their craving for The Way They Used to Eat and their toddler’s Craving for White Pasta…it’s this book. 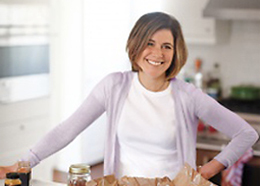 Kelley’s recipes take you far beyond the barren world of tomato-and-bagged-lettuce salads into the promised land of hearty, healthy, grain-rich, colorful, incredibly flavorful masterpieces you’d serve to any dinner guest — Seared Salmon with Quinoa, Asparagus, and Spinach; Thai Style Grilled Beef Salad; Toasted Barley, Long Bean, and Shitake Mushroom Salad with Tofu. And yet, very few of them seem out of reach. I opened the book during breakfast, found this jackpot Indonesian Chicken Salad recipe below and realized I had every single thing I needed to get it together for that night. Maybe you do, too. 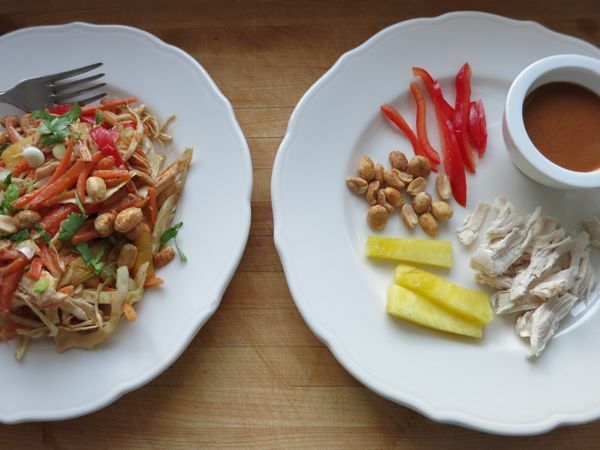 The peanut dressing is what ups the wow factor here, but it’s definitely spicy, so if you are worried about that with the kids, I’d limit the Sriracha to about a teaspoon. Also, Kelley instructs roasting the chicken on a rimmed baking sheet along with 1/4 cup of water then tented with foil. (About 40 minutes at 375°F.) I usually poach, but was curious about her method and found it to be much easier. The chicken (bone-in breasts) ended up incredibly tender and shred-friendly. In a large bowl, whisk together all dressing ingredients. Season with salt to taste. 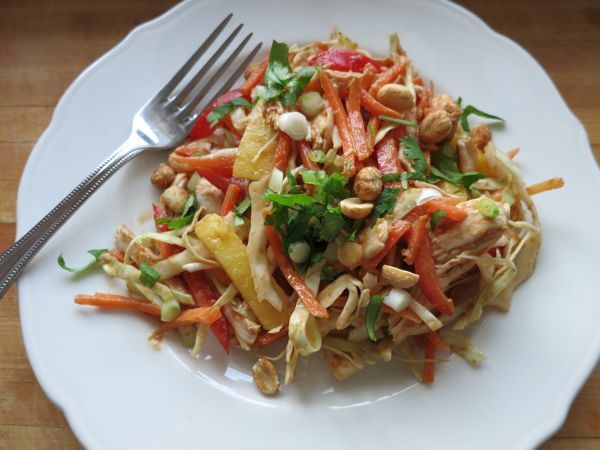 Add the cabbage, pineapple, carrots, red pepper, scallions, cilantro, and chicken and toss to combine. Serve sprinkled with peanuts and a squeeze of lime juice. If you are deconstructing this salad for kids: Whisk dressing in a separate small bowl and serve separately from salad. (Or in a little dipping bowl, as shown above.) Instead of tossing all the salad ingredients together, place each one in its own clump in a wide shallow bowl, have the kids pick what they want, then proceed to toss for the normal people. 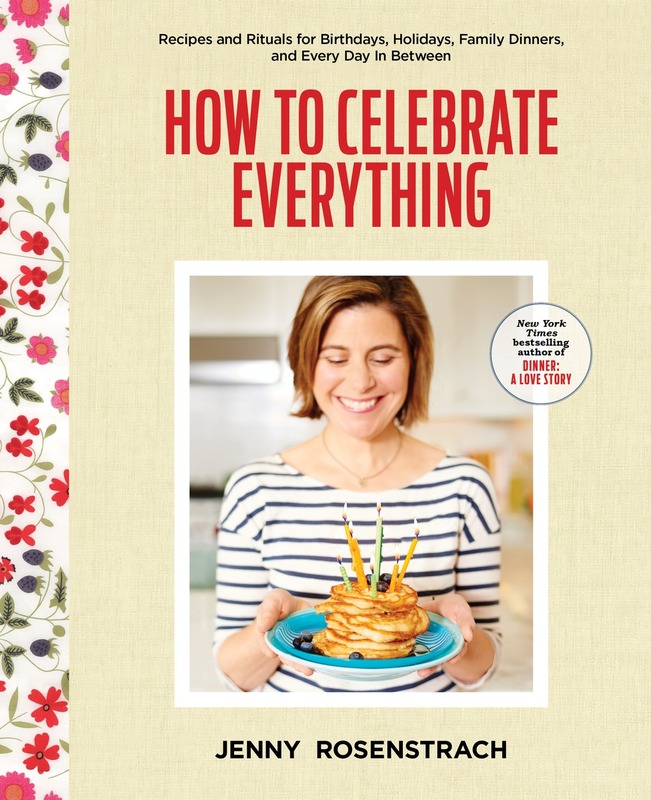 Last year, I couldn’t walk into a food editor’s office without seeing Jeanne Kelley’s book right on the very top of their cookbook pile with post-its sticking out of every side. I don’t know what took me so long to get my own copy, but I have a feeling I’m going to be using it a LOT. We are ALL about deconstructing recipes right now! The big people in our house want TOTALLY different from the little people. Thanks for this! 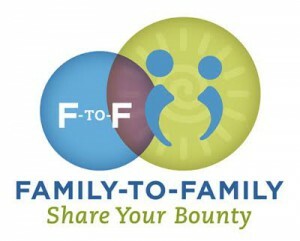 The deconstructing ethos is also big in my house, where my husband doesn’t eat fruit and my son doesn’t eat nuts. Yum! Deconstructed salad niçoise are very popular in our house. Some get poached egg, some get scrambled, some get more tomatoes then others, some get “pink sauce” (mayo and ketchup) and some get mustard vinaigrette, some like it piled, some don’t, everyone gets tuna….etc. Looks delicious – if I leave out the pineapple, even my husband will eat it. I have everything for this, too – such a happy alignment of the planets! I look forward to spending more time looking here but for today, thank you for the introduction to the cookbook as well as for this recipe. Man, this looks so good. I wish I could be more creative with salads, but I have a hubby that refuses to eat any salad dressing except for Ranch. Kind of limits the salad options. 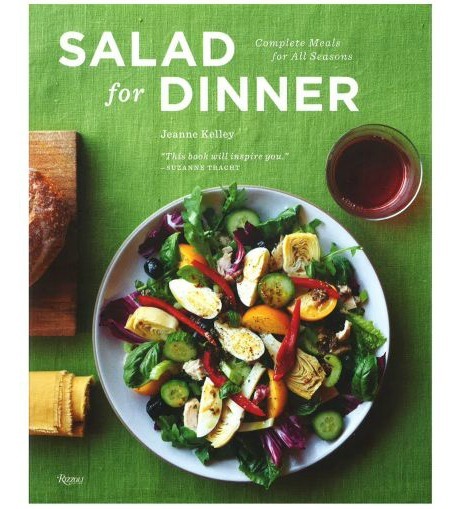 I love salads for dinner and this book looks like it takes a fun and creative approach to salads! I definitely gotta have it! Thanks for the recommendation, I’ve added this book to my reserves list at the library. I am trying to fit in at least one “salad for dinner” per week at my house. This book would be great! what I love about salad for dinner and deconstructed salads is it gives kids a way into learning to like salad. it drives me crazy when people say their kids don’t like salad – if you give your kids salad for dinner and do it in a way that they can eat what they like, it starts to open up the possibility of eating lots more things, in different combinations and leads to them viewing salad as something they eat. Similarly, good quality salad bars are fun because they can eat and pick from many good choices. we have a routine of having dinner from the whole foods salad bar in certain situations and I’m always amused at their choices – completely different from each other and mine, but still great choices. Hi! The book sounds great, and I was literally surfing over because I”m shopping tomorrow and planning to have a Big Salad night. Perfect! Will you clarify the chicken roasting method? So you pop the chicken and 1/4 c water onto a roasting pan and put it in the oven for 45 minutes. When do you tent it with foil? After, or when it’s still in the oven? Thanks! NICE> Great ideas. Wish hubby loved salads more, I cannot get him to eat quinoa…. That book was a complete game-changer for me. I had never used a recipe to make a salad before but it made it 1000% more delicious. I think I always had a proportions off before. One of my favorites is the farro & kale salad. The other thing I will say about this book is that since I started cooking from it, I have adjusted the meat-to-veg ratio on the plate without even thinking. When you come at dinner from the question “What meat should I have with my greens?” instead of the other way around, you know you’re going to end up eating well. Cay: For the chicken, place your bone-in chicken breasts (or even boneless if you don’t have bone-in) on a rimmed cookie sheet (or a baking dish), then pour a 1/4 cup of water into the pan along with it. Add salt and pepper to chicken. Cover with foil and roast at 375°F for 45 minutes. Oh my gosh! I made this last night for my whole family plus in-laws and it was DELICIOUS!!! I left the whole salad deconstructed — and it looked so pretty all laid out assembly line style on the kitchen island. I also added shelled edamame and cucumbers. BONUS: I was able to get every single ingredient at my beloved Trader Joes (except the Srichacha)! I usually poach my chicken breasts ( or cheat and buy a rotisserie) but the cookie sheet method was genius and will be my new go-to when I need breast meat for a salad, enchiladas, etc. Thank you for pointing me in the direction of yet another great recipe that will go into my family’s meal rotation! Jenny, how can it be that you had all the ingredients in the house already. What were you planning to do with the cabbage and pineapple before this recipe came to mind? Cabbage and cilantro are somethings I never have lying around my kitchen. When it comes to vegetables, herbs and meat, I only buy what I’m already planning on cooking. Thanks so much for featuring this book! Happily my library had it on the shelf although after a first perusal and umpteen marked recipes later it found it’s way into my Amazon cart. Already love the lemony salmon salad and balsamic chicken. A great way to get more veggies on all our plates! oh, I usually love recipes offered from this website (and i love the book) but I found this one lacking. It seemed bland, and I couldn’t get the sauce spicy enough. Maybe the addition of some fish sauce would help with the blandness? I don’t know. Also, although even lightly dressed, in short time it was limping. Such a bummer, and I have *tons* of it leftover. Fortunately, my husband enjoyed it more than I did. “Then proceed to toss for the normal people”. Ha! Love it!!! I’ve been cooking my way through your recipes since receiving your book for Christmas from my sister Kate. I really love your voice and food philosophy. Oh and my husband gave me the bumper sticker for Valentine’s Day so clearly I’m a Superfan. I made this salad for dinner tonight and it was fantastic! Our boys ate it deconstructed, my husband ate it without the Sriracha, and I had extra Sriracha. The baby just looked on longingly. My kids DEVOURED this meal. Loved, loved, loved it. Thank you!! I love creative takes on salad – this looks great! Thanks for sharing! I’m making this tonight. I only have skinless, boneless chicken breast, so I’m going to stir-fry it. Usually I roast bone-in, skin-on breasts a la Ina Garten — same temperature and time and the method you used. I made this this week finally after lusting after the cookbook for a month. This is delicious and my new go to slaw for dinner! Made this earlier in the week for my family of five (kids: 6, 4, & 1) & everyone really liked it. Hubby wasn’t so crazy about the pineapple. I didn’t enjoy it left over, though. And I tossed the whole salad together & then hubby was late from work. I thought the chicken texture was off, perhaps from the pineapple…is that possible? I might keep the pineapple on the side next time b/c I did enjoy the flavor. Requested the Salad book from our library. Thanks! This salad looks fantastic! I’d love to try it but I’m pretty wimpy when it comes to spice. Any suggestions on what I can substitute for Sriracha that would have less heat? Thanks! This is my new favourite salad! I added a cucumber and mixed broccoli slaw with the cabbage. I’ve eaten it almost daily for the past 2.5 weeks! Mandy asked about the pineapple and the chicken texture. Yep, it was the pineapple’s fault. It contains bromelin, which is an enzyme that breaks down protein. Just made this yesterday and our whole family really liked it! I work evenings and I make dinner in the morning for my family; the deconstructed concept worked well for prepping ahead of time. This was fantastic! Although I will have to echo the pineapple/bromelin issues from some earlier comments. It was delicious the first day, but as I went to eat the leftovers for lunch at work the next day…the texture of the chicken was a little icky. I suggest reserving whatever salad you’re planning for leftovers and adding pineapple right before you eat it. Thank you for this! made it last night and LOVED it! Even the kiddos! I just made this salad for my two sons who promptly declared it the best thing they had ever eaten. My 15 year old even said he would like to eat it for breakfast, lunch, and dinner — which is the highest compliment from the teenage boy set. Thank you!